Bedroom in the main adobe at Rancho Camulos. Undated photo (probably about 1890 when several other photographs were shot at the ranch). Unattributed photographic print in the Natural History Museum of Los Angeles County's Seaver Center for Western History Research (Catalog No. 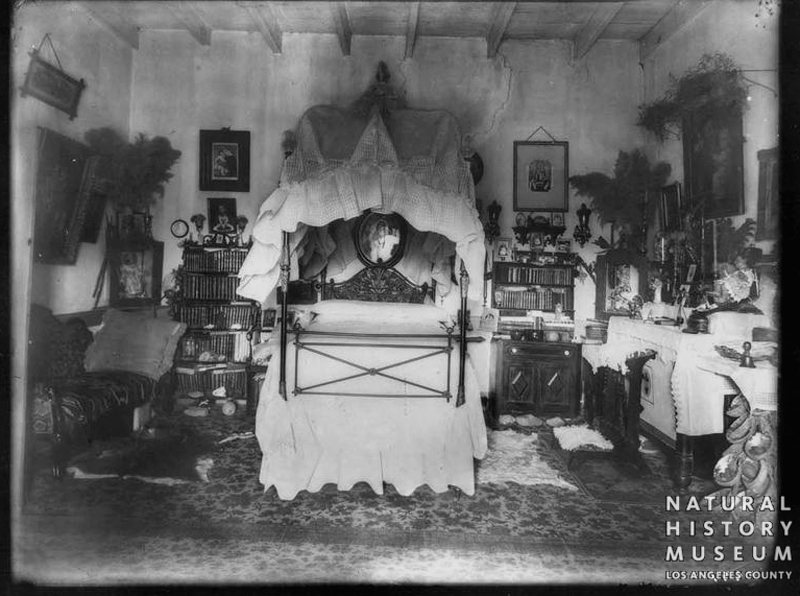 GPF.0538), where it is identified only as "Camulos ranch, Del Valle's room (interior)." The Del Valle family built the main adobe home in 1853 — at which time they owned the 48,000-acre Rancho San Francisco (western Santa Clarita Valley) — and lived in it continuously from the 1860s until 1924 when they sold the ranch to August Rübel, whose heirs still own it in 2014. MU0538: 19200 dpi jpeg from smaller .png file.